Work From Home Reviews Can Lazy Profit Explosion by Declan Mc & Spencer Make You $10K/Month? Can Lazy Profit Explosion by Declan Mc & Spencer Make You $10K/Month? Rating: 4 A solid program with loads of training materials and several case studies. The Good: You get lots of training videos, PDFs, case studies, links to software websites, etc. You get access to other online programs and their training areas. You can join Facebook groups that help you succeed. The Bad: There are some upsells at the very beginning of the program, and other upsells scattered throughout the training areas. You will need to devote some time, effort and money into being successful with this system. Some of the recommended niches are highly competitive and require extensive marketing knowledge. The Bottom Line: This is good program to try if you are committed to video marketing. I scrolled down, assuming I’d see some coursework or tutorial videos. Welcome to Lazy Profit Explosion- now buy more stuff! Instead, what I had landed on was a second sales page that enticed me to purchase a Pro Package version of Lazy Profit Explosion for $27. My ‘Cut & Paste’ Free Traffic Secrets ($497) – As described on the sales page: ‘ninja traffic secrets’ that will get you free traffic. Powerful NEW ‘Profit Doubling’ WP Software ($97) – A Wordpress plugin that monetizes your videos by inserting your own ads and opt-in forms. Attention-Grabbing Thumbnail Secrets ($47) – Secrets to getting traffic to your thumbnails and videos. How To Use Annotations & Tags Like A Pro ($97) – How to tag your videos so they get traffic. “Done For You” List of Quality Traffic Sources ($97) – A list of 50+ traffic sources that will help put your videos at the top of Google and YouTube search results in < 24 hours. Raj’s Personal Master Template ($497) – The exact template that Raj has tested and uses to create highly converting campaigns. The 4 Crucial “Points” To Tripling Profits ($97) – Four points that get viewers to click through to your site. Ninja Strategy on Getting Paid Traffic For FREE! ($197) – How to get paid YouTube traffic for free. Raj’s High-Converting Script ($297) – Sales copy for you to copy and paste into your own sales pages and emails. This product was priced at $47, but I could knock down its price to just $27 by clicking out of it. There are four training modules available in the members area and, except for Module 1, they all consist of videos. Lazy Profit Explosion PDF Guide – This 16-page guide introduces the main purpose of Lazy Profit Explosion, which is to find and create cheap sources of paid traffic. Your main source of this paid but cheap traffic is YouTube video ads. You don’t need to personally create these video ads; instead, you can outsource them to Fiverr. After you upload those videos to YouTube, you link your YouTube account to Google AdWords. You are told that you can get really cheap video ad clicks if you target, and later retarget, niche audiences. Video 1: How To Create Your First “Lazy Profit Explosion” Campaign (10:41) – You are shown how to create your first Google AdWords video campaign. The video takes you to the AdWords platform, where you are shown step-by-step how to create a video campaign. Video 2: How To Setup Your Targeting Groups (6:03) – In Google AdWords for video, you can select targeted groups for your YouTube videos. Significant direction is provided on how to target your audience by selecting their age, gender, parental status, interests, topics, etc. Video 3: Using Negative Targets (2:03) – You are shown how to exclude certain audience members on either a campaign or target group level. You can exclude audience members based on interests, specific websites, keywords, etc. Video 1: How To Link Your YouTube Channel (2:51) – You are instructed on how to link your YouTube account to Google AdWords because, in this mode, you gain access to additional features such as video statistics, call-to-action overlaps, remarketing and engagement statistics. Video 2: In-Stream Ads vs. In-Display Ads (2:55) – The differences between in-stream and in-display ads are explained. In-stream video ads are shown before a YouTube video starts. In-display video ads are shown on YouTube search, inside the Google Display Network, and next to other videos. Using both ad types is recommended. 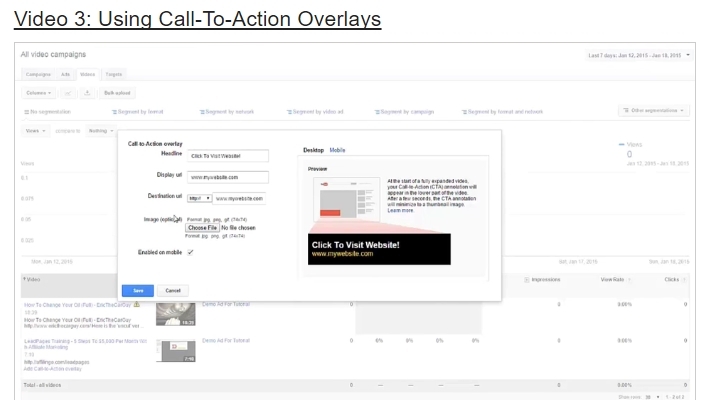 Video 3: Using Call-To-Action Overlays (1:17) – You are introduced to call-to-action video overlays and where these overlays will be displayed. Video 4: How To Use The Elimination Tool (2:17) – You are shown how to select your bidding amount based on the audience you are targeting. You are also taught how to change audience parameters. Video 5: How To Copy Campaigns, Ads & Targeting Groups (2:17) – You learn how to copy your campaigns, ads and/or targeting groups with just a few mouse clicks instead of re-creating these elements from scratch. Video 6: How To Add Content Label Exclusions (1:24)- You are shown how to add content label exclusions to your targeting groups. This is akin to the G, PG, PG-13, etc. ratings seen on movies, where certain audiences are excluded from viewing your video ads. 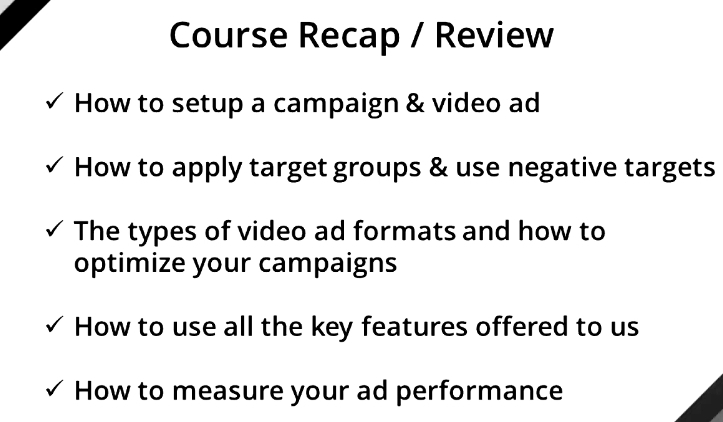 Video 1: How To Measure Your Ad Performance (1:11) – You are introduced to areas on Google AdWords where you can analyze the audience response to your video ads via the Ads, Videos and Targets tabs. Only two out of the three tabs are introduced because the instructional video itself cuts off before getting to the Targets tab. 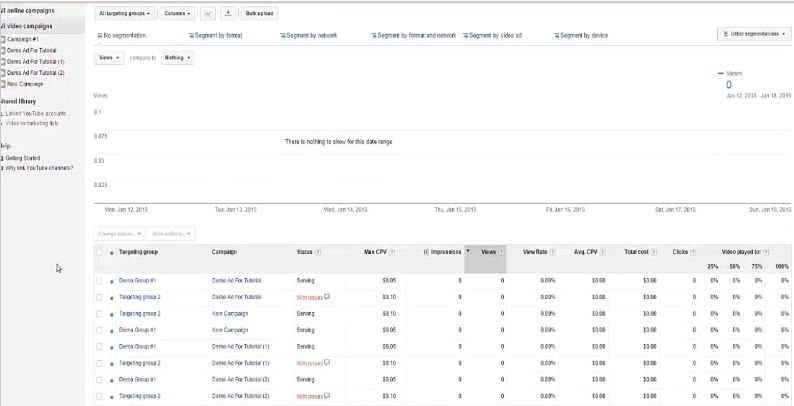 Video 2: How To Generate Reports Of Your Ad Performance (0:56) – You are briefly introduced to different ways to analyze and filter your response data on the AdWords platform. Video 3: How To Generate Placement Reports (2:09) – You are shown how to check the statistics on your video ads once they’ve been running for a few days/weeks, including how to check which keywords, networks and audiences are producing the most views. Video 4: Tabs & Segmentation Filters (3:24) – You are instructed on how to segment your audience, and why this segmentation is important. 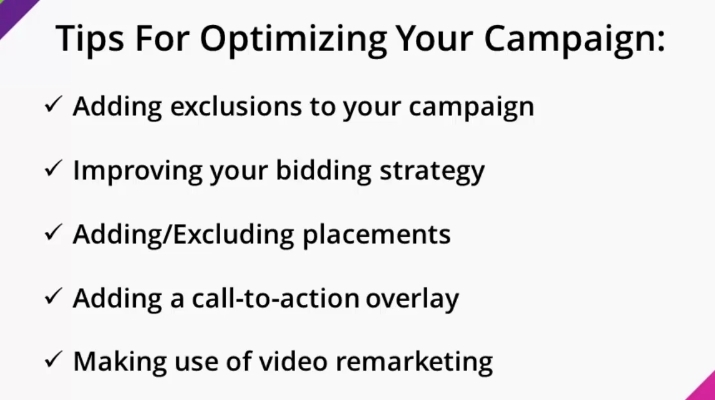 Video 1: Optimizing Your Campaign For Maximum Results (3:24) – After your campaigns have been running for a few weeks, you should analyze your audience data further and take steps to focus on those audience segments that are converting. Such focusing tips include increasing/decreasing your maximum bid, excluding insignificant view sources and keywords, and adding call-to-action overlays. Video remarketing, also known as retargeting, is introduced. Video 2: How To Use “Remarketing” (4:51) – Retargeting is useful because it follows audience members who have already viewed your product video but haven’t yet converted. However, because these viewers have shown interest in your products, they are “warm leads” and can be retargeted with slightly different/better offers of the same products. Within your AdWords-linked YouTube account, you can retarget your video viewers. You are shown how to do this by creating a video remarketing list and filtering your viewers by action (e.g., viewed your video, shared your video, commented on your video). Video 3: Setting Up Your Payment Method (3:31) – You are shown how to set up your payment method for your video ads. You are taken to the billing section of your account and directed on how to fill out your information, etc. No B.S. Case Study for Lazy Profit Explosion – This 8-page PDF details how you, as a video marketing newbie, can use OfferVault to locate a profitable CPA offer (in niches like health and fitness, make money online and forex), create a video ad for it using Fiverr, and generate a video campaign for your CPA product through YouTube. The case study that is presented shows a video ad campaign that cost $43.29 to set up and generated 481 clicks and $662 in revenue. InstaProfit Machine & Cheat Sheet -You gain access to the entire InstaProfit Machine, which contains three training modules of its own, plus loads of PDFs and additional tip videos for generating traffic, writing good copy, etc. This “system-within-a-system” certainly had me impressed with all its additional material and training. For example, just one training PDF found within InstaProfit Machine provides a 35-page PDF tutorial on copywriting. 3-Day Cash Machine – This 8-page PDF gives you with an outline on approaching other Internet marketers and product creators and collaborating with them to sell their products. You get a general idea on how you can start networking with others to make money fast. Tube Commission Sniper – This site provides you with a set of tutorial videos on picking a winning affiliate product, compiling your video review, and uploading and ranking your video review. You also get a set of links going to free trial software products like Camtasia, OpenOffice, etc. Other bonuses include the lengthy Social Media Authority and Zero Cost Traffic PDFs and access to a ‘Marketing with Mike’ Facebook group. Social Lead Sniper – You get a set of videos on how to set up your social profiles, gain followers, auto-message your followers, and create squeeze pages. You are also shown a detailed case study of this method in action. Another included bonus is a Social Media Marketing Tips PDF. Is Lazy Profit Explosion worth its price? Even if you buy none of this program’s upsells, Lazy Profit Explosion provides you with loads of information and access to additional programs, tutorial videos, lengthy training PDFs, etc. It is definitely worth its $17 price tag. While the program itself is not a scam, it does mislead you into thinking you will do little to no work and devote only a few hours to learning about video ads. Just watching and going through all the training material, and then trying out this system in “real-time,” will take at least a few weeks to complete successfully. Also, it will cost money to implement all the tips and tricks that are detailed in Lazy Profit Explosion. Even if video ads are optimized and cost only a penny per click, they are still going to cost money. Whether or not you’ll make as much as $10K/month with this system is a crapshoot. You could make $10K/month…or you could end up blowing a lot of cash on video ads and get no conversions and sales. This is not as simple of a money-making method as it’s advertised to be. I had also hoped that Lazy Profit Explosion would’ve devoted more time and attention to best practices when outsourcing videos through Fiverr, and which video styles/formats (e.g., testimonials, cartoons, product demos) work best to convert audiences. Overall, though, if you are truly determined to advertise using video ads, this program will be useful to you. This is by all means the BEST REAL review of lazyprofitsexplosion I have come by. Many thanks and Kudos to Steven.